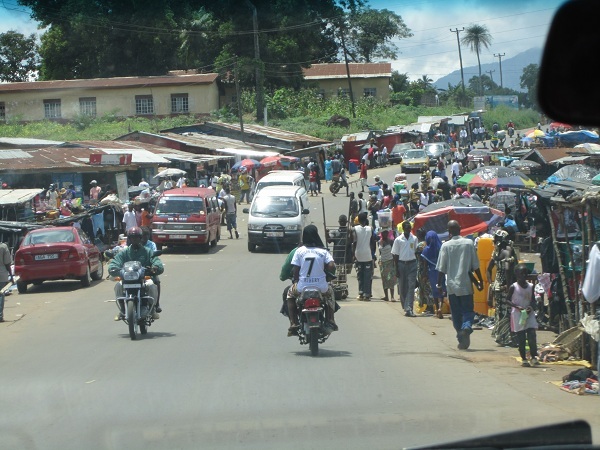 Freetown offers an array of transportation options, each unique with its own thrill and charm. In Freetown, Sierra Leone, a range of transportation options welcomes you in every street corner, each option varying in safety, price, comfort, and convenience, and a few requiring some degree of hitchhiking. 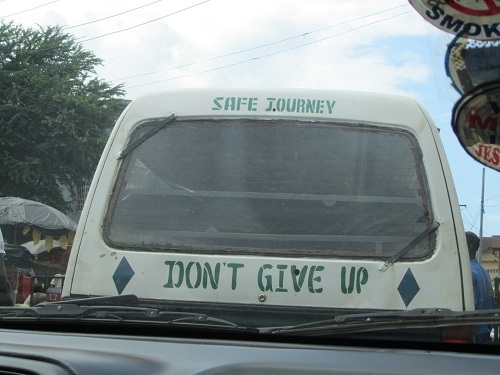 Being a hitchhiking and Freetown transportation novice myself, I had no idea what to expect when local friends and colleagues encouraged me to flag down random drivers and hop into unfamiliar vehicles to travel around town. The thought of using hitchhiking as a means of transportation and quickly developing trust for anonymous drivers challenged my “don’t jump into cars with strangers and definitely don’t hitchhike!” voice I had held onto since childhood. 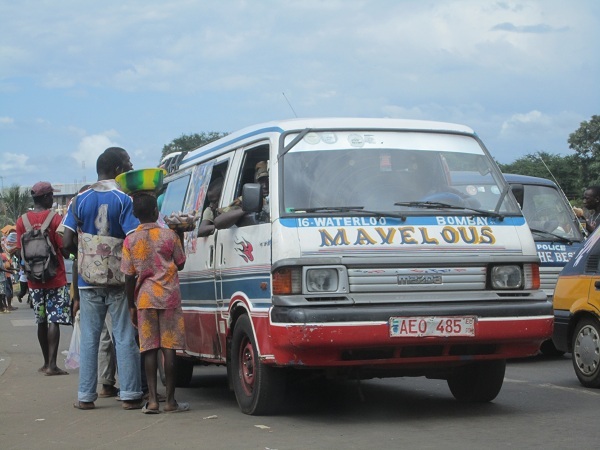 But through a few initial experiences, I’ve learned how adventurous, convenient, and safe taking shared vehicles and hitchhiking in Freetown can be, and have gained even more respect for the loan officers and Kiva Coordinator who make such adventurous treks to visit borrowers almost daily. Many poda-podas have words of advice or faith written on the back. This was especially encouraging! My stomach flipped a few minutes later, when a poda-poda sped by and made a quick turn to pull over to our side of the street. “LET’S GO!” yelled Mbalu, as she ran towards the open car door, along with the rest of the crowd who were pushing to get on and yelling out their destination to the driver. I jetted, held my backpack like it was my baby, and threw my head between my shoulders. “COME ON! This one’s going in our direction! There won’t be any seats left!” she cried. Poda-podas only have 18 available seats and 25 people were waiting, which meant some of us were going to be left behind. We grabbed onto the door as the rickety poda-poda began to pick up speed, and threw ourselves down onto our seats. We both released heavy sighs in relief. “We made it,” we silently conveyed through our big grins. At least, for now. “Ok, that wasn’t so bad,” I thought to myself as I enjoyed the ride. 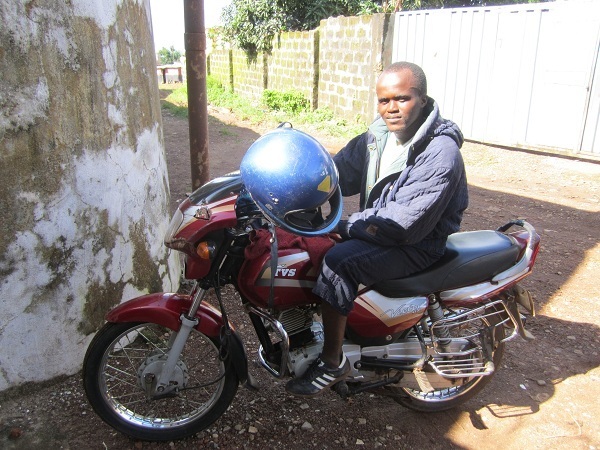 After about a 20-minute ride to the east side of town, Mbalu signaled to me. “It’s time to get off,” she remarked, “they won’t take us any further, so let’s walk and find another car.” We paid the driver 1,000 leones each, hopped out, and started to walk down the narrow road, where each step was like playing a game of chicken with an oncoming car, poda-poda, and okada (motorbike). Once we reached the main street, Kissy road, we were met with bumper-to-bumper traffic, and no poda-poda or shared vehicle in sight. “We will have to walk for a while to find another poda-poda” she shrugged. “I think the taxis are on strike today and the rain washed out the good road, so poda-podas won’t travel there.” After walking through the city for a few minutes, we stumbled upon another poda-poda hot spot, and reenacted the pushing and climbing-into-vehicle adventure from earlier that morning. Once inside, we smiled at each other and wiped the sweat off our foreheads. This poda-poda, with Waterloo written across the front, would take us directly to our destination. The Waterloo poda-poda: an adventure on wheels. After about an hour in the second poda-poda, we arrived painlessly to the Waterloo office, where we met with area managers and credit officers to review a few upcoming Kiva-BRAC related projects. We enjoyed a nice meeting and locally prepared lunch, but after a few hours my mind began to wonder how we were going to get home. I didn’t see too many vehicles going in the opposite direction, so perhaps we were in for a treat that afternoon. As we wrapped up our meeting, Mbalu and I walked to the main road in Waterloo, where the scorching sun showed no mercy. After a few minutes of watching packed poda-podas speed by, we successfully waved down a poda-poda with two open spots, but Mbalu turned to me and said, “This will only take us part of the way. There is bad traffic in town, so we will have to find another driver once we get there.” By then, I was convinced we would be able to find another shared car, but once we arrived into town, my hopes deflated. Standing in the middle of town, Mbalu and I squinted in the heat, searching for an available shared car in the slowly moving row of cars. I resorted to waving at oncoming vehicles, flashing the two-sign in the air, indicating there were two of us that needed a ride back together, while Mbalu called out our destination to a slowly-moving row of private and shared cars and vans. Every minute in the heat seemed like an hour, and we were growing helpless and desperate. As we started to lose faith (and our minds), a young man rolled down his window to ask us where we were going. “Two places, St. John and Congo Cross, but you can take us into town if that’s too far,” Mbalu responded in Krio, the local language. He nodded and took us into his car, where we hopped in and thanked him profusely. “We were about to pass out on the sidewalk!” I exclaimed, ignoring all reservations I ever held about hitchhiking. The driver, named Michael, laughed and then turned up his Bob Marley CD as we slowly moved through the traffic. I gazed out at the gridlock while Mbalu directed Michael towards her destination and mine. Halfway through our trip, Michael remarked, “I’ll take you the whole way, no problem.” His kindness left us speechless, as we were expecting to probably take at least 2 more vehicles to get into central Freetown, and knew that enduring Freetown traffic to take both of us to our destinations was not on his list of fun things to do that afternoon. Mbalu and I on a visit to the field. After an hour of driving, Michael dropped us at our destinations. He pulled the car over and pushed away the money we had offered him. “No, no. Just make sure you find a good okada to take you from here to your home,” he smiled. I assured him I would find a safe driver, but his kindness had me at a loss for words. I hopped out of the car and waved good-bye as Michael drove off with Bob Marley blowing through his speakers. As I walked through the junction, I searched for an okada that would take me home. My clueless, tired glance drew a handful of okada drivers my way, each offering to take me to my neighborhood for an affordable fare. I glanced up and locked eyes with a familiar face: Emma, a young man who drives an okada and lives in the same neighborhood. We met on one of my first days in Freetown, as I was searching for a motorbike driver to take me home (taxis won’t travel on the rugged roads), and he had an extra helmet and commercial license plate (2 requirements when taking an okada). Since then, he’s been my trusted okada friend, or as a passer-by called him, my okada for life. “Need a ride? Hop on.” He threw me his helmet, and we sped off on his motorbike through the rugged, rain-beaten road to my home. My Freetown okada friend, aka okada for life, Emma. The experience and thrill of traveling through Freetown has so far been nothing short of an adventure, and has opened my eyes to the long journey BRAC staff make when visiting borrowers or branch offices. It adds even more value to the work that they do, and makes me very thankful to be here. 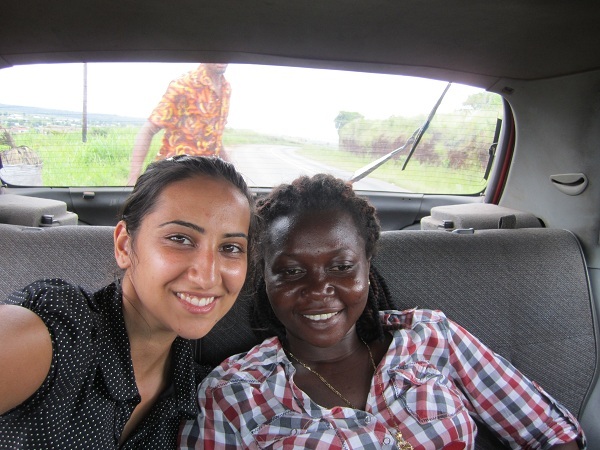 Tejal Desai is a Kiva Fellow serving in Freetown, Sierra Leone. She is working at BRAC Sierra Leone, and enjoys learning Krio to help navigate through Freetown. Join BRAC Sierra Leone’s Lending Team and support entrepreneurship in Sierra Leone by lending to a BRAC borrower. Entry filed under: blogsherpa, KF16 (Kiva Fellows 16th Class), Sierra Leone. Tags: blogsherpa, Freetown, KF 16, Kiva, Kiva Fellows, kiva.org, microfinance, Poda-Poda, Tejal Desai, transportation in Sierra Leone, Travel. Tejal- I love that you have an ‘okada for life’ 🙂 Great post! I second what James said. A trying experience, for sure, but after chipping away at it for a while, you turned it into art. Nice Post! So well written. Cheers!